Providing a superior customer-service experience for tenants is one of the most important things a self-storage manager can do to ensure the success of his facility. This book discusses common-sense ideas and techniques proven to provide the self-storage customer with the highest levels of service and satisfaction. By using the approaches outlined in this book, you can clearly differentiate yourself as "the" self-storage professional in your market. What is superior customer service? What is your customer-service attitude? 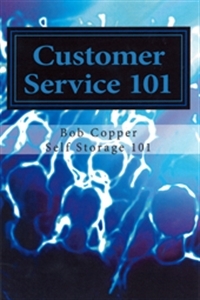 Bob Copper is the partner in charge of industry consulting firm Self Storage 101. As a prominent consultant, author, speaker and trainer, Bob has worked extensively with hundreds of self-storage owners, operators and managers to develop strategies for operational improvement, revenue growth and value enhancement. As a self-storage owner himself, he has a unique perspective that relates to working with other operators. Bob and his team have conducted countless facility audits and operational reviews, market studies, and due-diligence projects. They are sought out for their unbiased opinions and many successful and productive years of experience. Bob's books, training webinars and live sessions are among the most popular in the business.